KANSAS CITY, Kan., Sunday, July 6, 2003 –Mark Taylor completed the longest climb to victory in IRL Infiniti Pro Series history by edging Ed Carpenter to win the Aventis Racing For Kids 100 on July 6, 2003 at Kansas Speedway. Taylor finished off a stirring, wheel-to-wheel duel with pole sitter Carpenter by beating him to the finish by .1666 of a second in the No. 4 Fulmar Panther Dallara. Tom Wood tied a career best by finishing third in the No. 9 Trailblazer Drilling/Savanna Energy Dallara, just .4088 of a second behind Taylor. Rookie Taylor averaged 151.988 mph for his series-leading third victory of the season. But there was no question this was the toughest win of the season for rookie Taylor. He was forced to start 13th in the 100-mile race after the Panther Racing team was penalized for a rules violation after post-qualifying technical inspection Saturday. Taylor had qualified for the pole before the violation was found. It was the longest climb to victory in the history of the Indy Racing League’s official development series, which celebrated its first anniversary at this event. 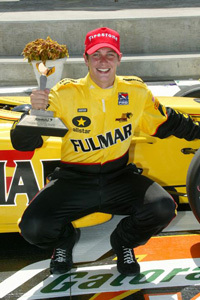 Aaron Fike climbed from ninth to win in September 2002 at Chicagoland, the previous record. Taylor’s charge toward the front was tricky. He made contact with the No. 36 Genoa Racing Dallara of fellow rookie Thiago Medeiros on Lap 20 of the 67-lap race, triggering the second and final caution period of the race. Taylor was able to continue, while Medeiros lost his front wing and was forced to pit. “It was tough,” Taylor said of his early laps. “The first 10 laps I was really struggling. So many cars in front of you. You try and think you’re making a move, then people are making a move in front of you, and you suddenly lose the gap that you think you have. On Lap 37, Taylor passed Wood for second and set his sights on Carpenter. On Lap 42, Taylor nosed past Carpenter at the start-finish line as their side-by-side duel for the lead heated up. Carpenter and Taylor stayed side by side for most of the next seven laps, with Freedom 100 winner Carpenter leading Laps 45-48 in his No. 14 Futaba/Delphi/A.J. Foyt Racing entry. Taylor took the lead again on Lap 49, holding it until Lap 65, when he and Carpenter crossed the finish side by side. Carpenter was credited with a lead of .0130 of a second on that lap, with Wood close behind. On Lap 66, Taylor drove under Carpenter to take the lead for good, holding on for the final two laps for victory. Wood trailed just behind at the end of a thrilling, wheel-to-wheel race. Taylor expanded his points lead to 221-156 over second place Carpenter in the series standings with the victory. “It was a great way to celebrate our one-year anniversary,” said Roger Bailey, Infiniti Pro Series executive director. “It was the kind of race that exemplified what the series is designed to be. I think every race could be of that caliber, with drivers giving and taking. We had some excellent, clean battles on track today. We had close competition, precision driving, and we put on a great show for the fans.